The Oregon Zoo's walk-through winter wonderland of more than 1.6 million colored lights is open and more popular than ever. This year marks the 31st ZooLights. Organizers offer six tips to save money, avoid lines and get the most enjoyment out of your ZooLights experience. 1. Start your festivities early in the season. During this year's Value Nights ZooLight visitors get a $5 discount on admission. Visit oregonzoo.org/zoolights. 2. Ride MAX to the zoo. On non-Value Nights visitors who take TriMet will receive a $5 discount on admission. Proof of ridership is required. 3. Consider taking Lyft and get a discount. Lyft is offering a 20 percent on the service fee for rides to and from ZooLights. Use promo code ZooLights18. 4. Show up fashionably late, unless you are driving. 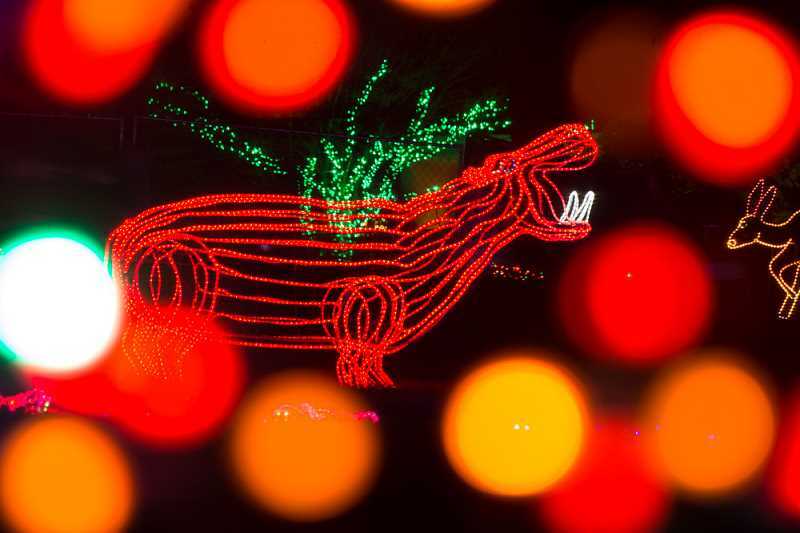 The big rush at ZooLights is from 4 to 6 p.m., you can avoid crowds if you arrive after that, unless you are driving. Parking lots fill quickly. Check real time on-site parking availability at gettingtozoolights.com/drive. 5. Buy your tickets online. You can buy admission and train ride tickets online at oregonzoo.org/zoolights. 6. You can see lights throughout the zoo grounds, so you don't have to focus solely on riding the train. Schedule your train ride online and then stroll around the grounds and enjoy the lights until your appointed train time. The Portland Revels will present its annual Christmas Revels show Dec. 14 through 22 at the Newmark Theatre in Portland. This year's production, "Highland Voyage," travels to Scotland with a story of three fools on a quest to put the sun, moon and stars back into the sky. It is a warm celebration with all the favorite Revels' traditions including the Abotts Bromley Horn Dance, a Mummer's Play, audience sing-alongs and more. For tickets visit portlandrevels.org. ScanFair, a two-day Nordic craft fair extravaganza which has become a Portland tradition, will be held Dec. 1 and 2 at Veterans Memorial Coliseum at the Rose Quarter, One Center Court suite 150, Portland OR 97227. Experience the sights, sounds, tastes and traditions of a Nordic Christmas during the holiday season. The event is reminiscent of Christmas markets in Copenhaugen, Helsinki, Oslo, Reykjavik and Stockholm, with vendors, food, entertainment, games and more. Admission is $10 for adults, $9 for seniors and students. Family pass for two adults and two children is $20, and children under 12 are admitted free.